Factory fog/driving lights cost upwards of $260. 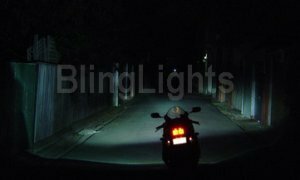 BlingLights lamps install within the factory fog lamp spots, outperform the factory lamps and cost less, guaranteed. Available in your choice of lens color; Clear 4000K, Blue 7000K, Gold Ion 3000K (click on the colors to view). Housing color also comes in your choice of; black or chrome. Clear 4000K lenses with black houses shown above will be sent unless requested otherwise with payment in memo section. This auction includes a complete fog/driving lamp kit for use on the model shown above without the factory fog lamps or as a replacement for existing factory fog lamps. This auction includes everything needed to install and requires no other parts or extensive modification. Hella offers the performance and brightness of Xenon H.I.D. bulbs and have photometrically designed hardened glass lenses that pierce through the darkness in any weather condition. Rectangle glass lenses, die-cast metal housing 55W H3 halogen bulb 2.4" H x 3.25" W x 3" D, 2 lamps, heavy-duty mounting brackets, LED illuminated switch, deluxe wiring harness included. Hella is one of the true leaders in the lighting industry. They produce Top notch lighting equipment that is manufactured in Germany. Hella lamps stand out as "lights with attitude". Take the BlingLights Challenge and try any BlingLights product no-risk. Then Decide. If you don't love it, you don't keep it. No obligation. Simply send it back, no questions asked - you keep the hat. Are these fog lights original equipment manufactured? No, these fog lights are manufactured by Hella. Many of our customers are able to install our fog light kit in a period of approximately 45 minutes to 2 hours. More involved installations may require drilling to position the lights where you want them. This kit includes mounting brackets that mount independently of the factory mounting points. The end result will be a clean look if done with care. For those uncomfortable with the install, have the kit professionally installed at a local car stereo shop. Will this kit fit my vehicle listed in the auction title? The lights can be mounted to light bar, body, strut bars, fender or to any other surface using the included versatile lamp mounts. Does your kit include everything I need? Yes, this kit includes 2 lamp enclosures, powerful H3-55 watt bulbs, fully adjustable mounts for bumper or bar, harnesses, pre-assembled wiring harness with relay and fuse, electronic switch, mounting hardware kit, installation instructions, and more. What type of bulbs come with your kit? Two genuine Hella powerful H3 bulbs with an output of 55 watts a piece, 110 watts total! These bulbs are designed for maximum output and durability. The bulbs generally last many years without the need for replacement. There is a good chance the bulbs will outlast the life of the vehicle. H3 replacement bulbs are a common size bulbs and can be purchased through us or anywhere else automotive bulbs are sold.